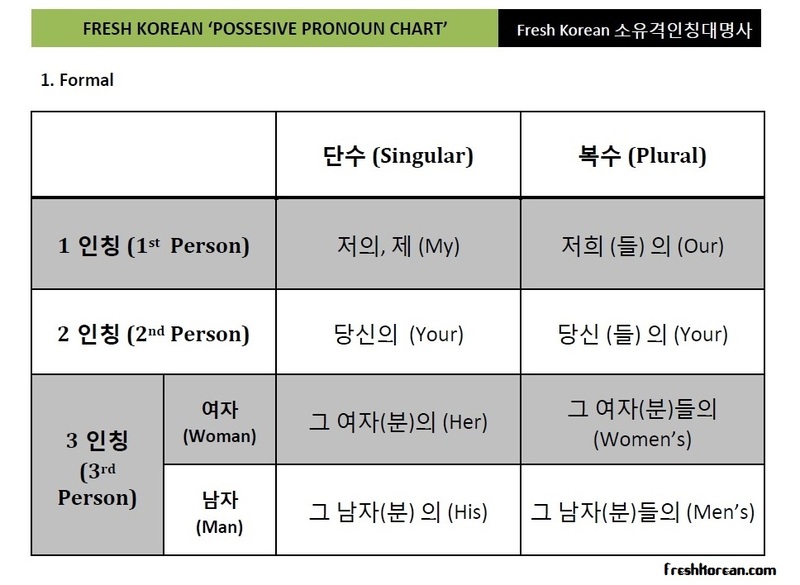 This is the second part in our irregular Korean Grammar resources series, this second part one we look at a Korean Possessive Pronouns Chart. The chart shows both the formal and informal forms of each Possessive Pronoun. They are further subdivided into Singular and Plural. Normally Korean (Hangul) sentences start with a Pronoun just like in English. So this chart is very useful either when speaking or writing in Korea. The only difference from English is that isn’t of having a genderless them, in Korean you can either describe a group of girls (them girls in English) or a group of boys (them boys). Formal and Informal is very important in Hangul. In general you should speak formally whenever possible unless speaking with close friends or people much younger than you. We have uploaded both JPEG (split into 2 parts) and high quality PDF version of the Korean Possessive Pronouns Chart for your enjoyment and use. This first part shows the formal form of the different possessive pronouns. This second part shows the informal form of the different Possessive pronouns. 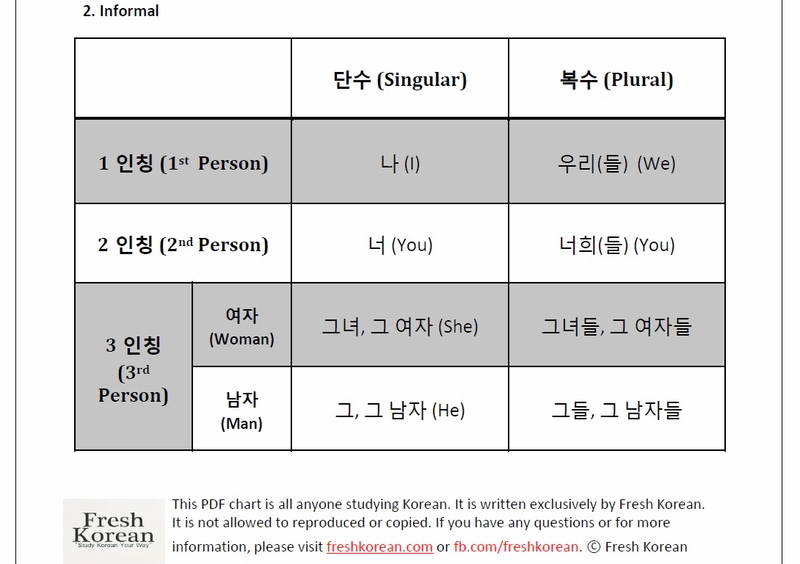 For our Korean Personal Pronouns Chart please click here. Thank you for your time and please come back soon for more Korean (Hangul) Resources. 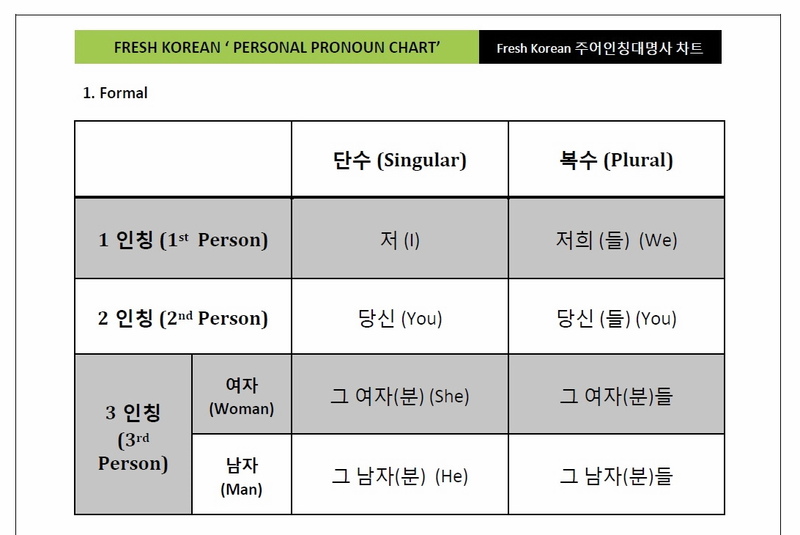 This is hopefully the first of main Korean Grammar resources, this first one is a Korean Personal Pronouns Chart. The chart shows both the formal and informal forms of each Personal Pronoun. They are further subdivided into Singular and Plural. 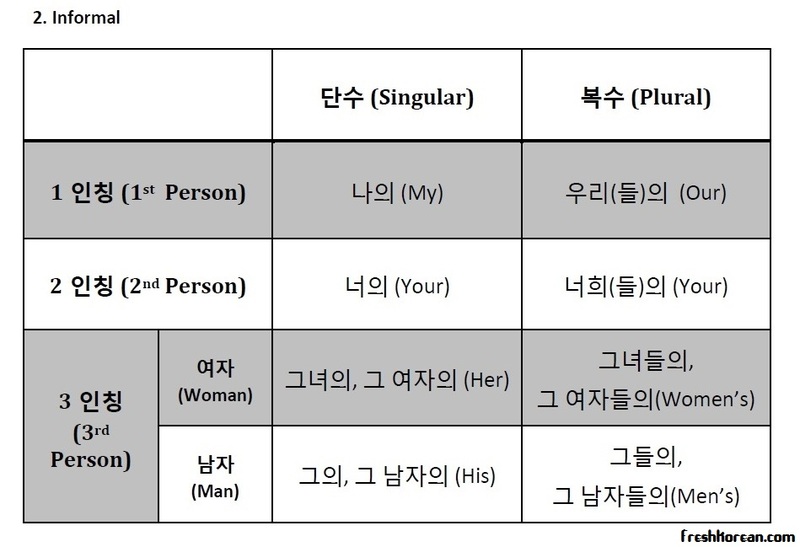 We have uploaded both JPEG (split into 2 parts) and high quality PDF version of the Korean Personal Pronouns Chart for your enjoyment and use. This first part shows the formal form of the different personal pronouns. This second part shows the informal form of the different personal pronouns. We are proud to present our latest free Korean (Hangul) study resource the Hangul Chart (How to say the Korean Alphabet). Just like in English the Korean alphabet is spoken differently then it sounds phonically. For example in English the alphabet goes ABC but phonically it sounds like Ah, Ba, Ca (sort of). The same is true in Korean (Hangul), for example when you read a Korean character alone such as ㄱ you don’t read it as G you say 기역 or gi/yeok. 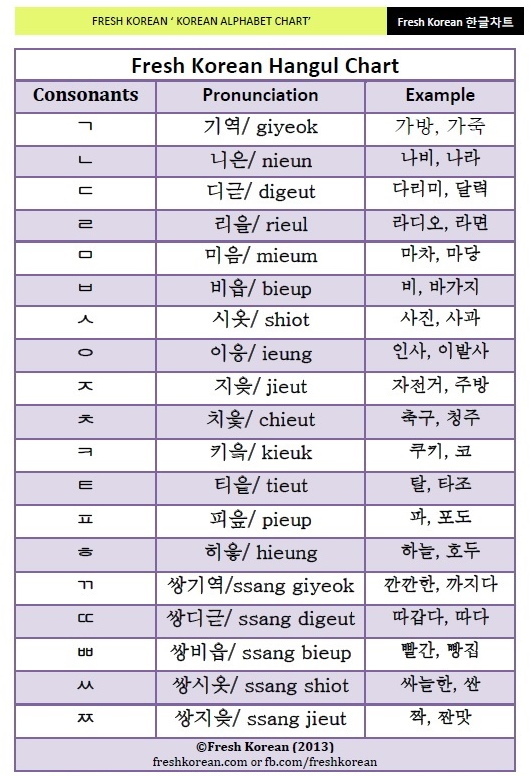 This chart is useful when studying Korean or just using it day to day knowing this list will be great. Such as if you need to ask for a spelling and also when spelling out words such as on the phone. Also below the download is a video so you can listen to how a native would say each of the characters. We have uploaded both a JPEG and high quality PDF version of the Hangul Chart for your enjoyment and use.